Except when in sleep, we are always in ceaseless activity. No one spends even a single moment without doing some action or the other (Gita 3.5). This action may be physical or mental. Why do we act like this even without a moment’s respite? If we closely watch ourselves, we can see our purpose: we are seeking happiness. We sit erect for happiness, change our posture for happiness, we eat for happiness, we fast for happiness, we marry or we are celibate, we seek company or solitude, all for happiness. In this way, happiness is the general goal of all activity and inactivity. 1). To Avoid Grief (Taapah). c). Adhidaivika: Due to natural causes like hot summers or cold winters. The peace obtained by eliminating these three griefs is known as ‘Shanti’. That is why we say Shanti Shanti Shanti three times. 2). The second type of activity is done to acquire what is good for us, like health and affluence. This is called Yoga. 3). The third type of activity is to retain what we already have. This is called as Kshema. This third aspect should never be missed sight of. We generally notice in history that almost all civilizations acquire a lot of material affluence in the beginning and after sometime they go into oblivion. This is because affluence begets vices like profane sensuousness, arrogance and laziness and eventually the balance in life is lost. It is easier to retain equanimity in poverty than prosperity. Therefore one should know how to retain the good things after acquiring them once. Success in this needs the practice of spiritual moral and ethical values in the midst of affluence. In other words, Dharma is the only way to retain all that is good in our lives. Doubt: “I am scrupulously practicing all Dharmic Values. I also worship God in total faith exactly in the way taught to me by pious Brahmins. However, I am not getting success. I am worried. Why so? Is it my fate?" Reply: Always remember that the Vedic philosophy is not fatalistic. The reason for not getting success is that our own previous Karma is stronger. Our present meritorious Karma should first annul our previous Karma (Prarabdha), and then exceed it quantitatively for getting success. Therefore, we should not despair; only improve the quality and quantity of our present Karma. There is no use in worrying. Query: “I am finding it difficult to avoid worry and work efficiently." Question: “My difficulty is different. I am not able to decide what is right or wrong. Only later, the success or the failure in my action shows what was right or wrong. How can I know it beforehand to avoid failure?" Answer: This is a most serious issue in life. Actually, human intelligence can never decide what is right or wrong. Notice that the success of any action depends not only on visible parameters but also invisible ones like previous Karma and God. While the latter ones are totally out of reach of human intelligence because of being invisible, the former ones too are partly out of our reach because they are generally too many. Normally people are skeptical or often even derisive about the invisible aspects. They look at some of the visible secular aspects and decide that something is right or wrong by inferential logic (Anumana). However, they too can never be sure enough to predict the outcome of any particular Karma with surety. Why Do We Get Into Jams? “What is it that you want to do today?" “What is it that you want to do in the next five years?" “What is that you want to do in your life?" Has anyone an answer? No. Why? Because people seldom have any specific goal for the life as a whole. That is why there is no direction in our activities. We do not have anything specifically good or bad. We go on doing whatever occurs to our mind without thinking either of the future or of the past. We are carried by the slogans of the times and move in the turbulent waters of life in a rudderless boat. Sooner or later, we get caught in a whirlpool or stranded in a quagmire. We do not know how to escape from there. We only end up cursing what we think is the reason for our predicament. 1). They should know the whirlpools, the high currents and quagmires of life, but be above them. 2). They should know why people get into them and how they can get out of them. 3). They should have sympathy and concern for people like us caught in the whirlpool of life. Who are such people who can help us? 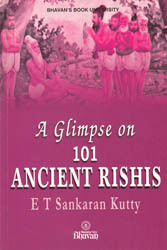 They are the Rishis (ancient sages) such as Manu, Yajnavalkya etc. They suggest the methods of escape. They give different instructions for different people caught in different situations. They are broad-minded and melt with compassion as soon as they see someone in distress. They have the panoramic vision of life which we lack. Therefore, only they can say what is right or wrong for each one of us stuck in different situations. Here we discuss the criterion on which the Rishis delineate an individual’s Dharma. As noted above, we do not have a specified goal for our life. The Rishis first prescribe such a goal for our life as a whole, which is to keep a constant bliss of happiness (Ananda) flowing to us. This unintermittent flow of happiness is known as Moksha. It is important to notice that Moksha is not something different from what we are already struggling for every moment of our life, namely happiness. However, compared to this temporary short-lived happiness, the ancient sages want to give us a state of pleasure which is constant and never ending. Since Moksha is the ultimate goal of life, we now have the criterion for deciding what is right and wrong, i.e. Dharma and Adharma. An action which helps us or anyone else move towards Moksha is Dharma, and an action, which hinders our or anyone else’s movement towards Moksha is Adharma. Scrupulously following Dharma, we will attain the state of perennial happiness – Moksha - sooner or later. Objection: How fair is it to fix the difficult goal of Moksha as the aim for everybody’s life? Resolution: No. The scriptures do no force anyone to have Moksha as the aim of his or her life. They only point to us that sometime or the other, in this birth or perhaps a million births later, life itself will force us to work for that aim. The reason is this: Material pleasure is polluted. It is not only momentary, but also generally coupled with pain like causing disease etc. So, it causes disillusionment in due course, if not direct sorrow. Therefore, one’s attention would surely turn to thinking about a happiness that is unpolluted with any of these shortcomings. Of course, to a large extent, the veracity of this statement can be verified even in this life. Everyone enjoys material pleasures with total abandon in youth, but develops remorse in old age for what happened. So we may not want Moksha as our aim now, but we will surely want it later. Question: “What would be my Dharma if I am interested only in material happiness and do not adopt Moksha as my immediate aim?" Answer: You can certainly enjoy material happiness, but it should be within the ambit of Dharma. If you resort to Adharma in order to satisfy your desire, i.e. Kama – it will surely end up in causing utter sorrow definitely for you and perhaps for others too. That is why the Vedas refer to two types of Kama: One within the brackets of Dharma and Moksha and another which falls outside. Here, Moksha is only the distant aim indicated by the scriptures and not your immediate interest. However you have Shraddha (faith) in the Vedas. Therefore for you the first type of Kama is a Purushartha, i.e. something to be sought after by every common man. But the Kama which lies outside the brackets of Dharma and Moksha is to be abjured. For example, conjugal pleasure with your life-long partner is Dharma because while it satisfies our natural urges born out of Samskara, it does not put us way from Moksha. In fact, a joint pious life would even move both of you towards Moksha, even though you may not be aspiring for it immediately. On the other hand, the same pleasure out of wedlock is Adharma. Ultimately it lands you and your kin in grief. Work hard and earn well by honest means only. Do Dana (charity) to the best of our ability. Never deviate from righteous conduct. Never deviate from the daily Puja. Never consume food without first offering it to God. Be disciplined in our food habits. Take physical exercise and keep off disease. It is our duty to look after our parents and keep them happy with our conduct. One should never stop studying and gaining knowledge – both secular and spiritual. Share it with your children. Give them a good Samskara. Never praise them when they achieve anything; just hug them silently and bless. This will galvanize them to achieve more. Praising will only make them egoistical which, in turn, stunts their growth. Respect your wife and do not enjoy anything without her. Let her be an inseparable part of all your religious activities. Remember: Dharma Dharma Dharma. Dharma helps us avoid grief. Dharma gets us what is good for us. And finally, Dharma helps us protect and retain what we already have. Excellent article that is needed in to day's world of stress and strain in all walks of life.